SHANGHAI—Chinese airlines were buffeted this summer by a series of cockpit blunders that put passengers’ lives at risk, pointing to what foreign pilots say are serious flaws in training as China’s booming aviation industry struggles to meet demand for flight crews. The mishaps included a July 10 incident in which an Air China Boeing 737 en route to Dalian from Hong Kong plunged 25,000 feet after the pilots mistakenly disabled the cabin’s air supply. They were trying to deactivate an air-circulation system so they could smoke, but ended up triggering an emergency descent. On Aug. 16, a Xiamen Airlines Boeing 737 jet lost its landing gear and an engine and skidded off the runway when its crew tried to land in Manila in heavy weather. Two weeks later, a Beijing Capital Airlines Airbus A320 lost its front wheels and damaged an engine as it bounced three times along a runway in Macau. The pilots aborted the landing and diverted to Shenzhen. Chinese airlines suffered serious incidents in July and August, which pilots say could be avoided in future with better safety protocols. A China Express Canadair CRJ-900 experienced a very heavy landing and sustained damage after the pilots mistakenly switched off both engines on approach to Tongliao. The ground proximity alarm sounded twice as a Shanghai Airlines Boeing 737 approached Nanchang airport, though the jet ultimately landed safely. A Shenzhen Airlines Boeing 737 skidded off the runway in Hohhot after pilots attempted to turn their speeding aircraft too soon after touching down. An Air China Boeing 737 en route from Hong Kong to Dalian plummeted 25,000 feet after the pilots triggered an emergency descent by smoking illegally in the cockpit.A Tianjin Airlines Airbus A320 sustained damage to its nose and windshield after flying into a hailstorm, rather than diverting around it, and performed an emergency landing in Wuhan. 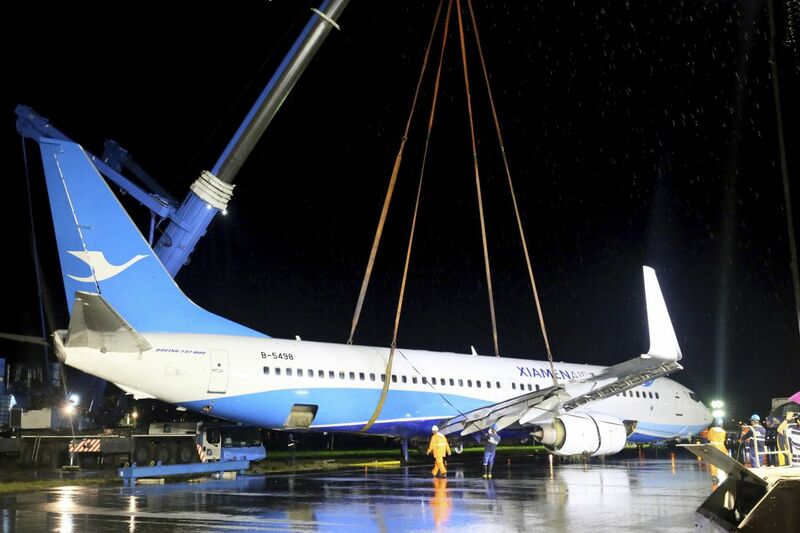 A XiamenAir Boeing 737 lands late at night in severe weather in Manila, causing the jet to lose an engine and its undercarriage, and to skid off the runway. A Beijing Capital Airlines Airbus A320 lost its front wheels and damaged an engine during a botched landing in Macau, before performing an emergency landing in nearby Shenzhen. These were among seven serious incidents involving Chinese airlines reported in July and August alone. 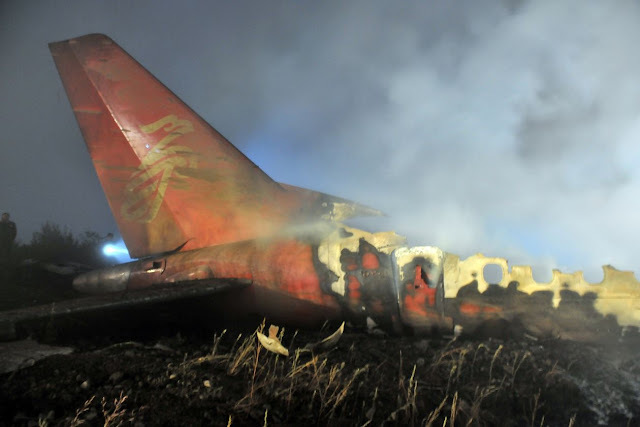 Though there were no fatalities, the mishaps were significant enough in most cases to receive media coverage and be addressed publicly by China’s aviation authority and the airlines involved. The less-serious incidents were chronicled by aviation websites, and in internal airline and civil-aviation bulletins reviewed by The Wall Street Journal. China’s Civil Aviation Administration didn’t respond to questions. But in a meeting with senior aviation officials in September, administration chief Feng Zhenglin ordered a national aviation inspection to root out “unqualified employees” and addressing the “excessive expansion” of civil aviation, according to an agency posting online. Chinese airline passenger numbers quadrupled to 552 million between 2005 and 2017, fueled by its rising middle class. Around 5,000 new pilots joined the country’s airlines last year, and Boeing Co. estimates China will need another 6,500 a year for the next 20 years to meet demand. That breakneck pace has put too many inexperienced aviators in the cockpit, seven foreign airline captains with current or recent experience with Chinese airlines said. Exhausting work schedules and harsh punishments for honest mistakes compound the problem. The Wall Street Journal contacted the airlines involved in the recent mishaps, but only state-run Air China Ltd. responded. An Air China spokeswoman said the carrier follows strict safety standards based on U.S. Federal Aviation Administration protocols. Air China, which said it only punishes pilots for making very serious mistakes, fired the pilots involved in the incident in which the Boeing 737 plunged 25,000 feet. China hasn’t suffered a major air disaster since 2010, when 44 people were killed in a Henan Airlines crash in the northeast city of Yichun in remote Heilongjiang province. China reported 41 aviation accidents and incidents in 2017 and 2018 to the International Civil Aviation Organization, the United Nations agency that sets global aviation standards. That compares with around 600 reported by major airlines in the U.S. for the same two-year period—a huge gap suggesting many incidents in China aren’t reported, said Greg Waldron, Asia managing editor at Flightglobal, an aviation information service. China isn’t the only developing aviation market that has struggled to balance rapid growth with safety. The FAA has downgraded countries including Thailand and Indonesia in years past over safety concerns. Foreign pilots acknowledge that aviation safety in China has improved significantly since the 1990s. Most airlines use brand-new planes and the country’s airports are world-class. Automation in modern jets also compensates for inexperience. Even so, Chinese aviation authorities focus too much on technical procedures and not enough on what is happening in the cockpit, the foreign captains say. Captain Andy Van Bastelaar recalled an incident last year where his Chinese co-pilot was guiding their Airbus A320 on final approach to a regional airport near Shanghai. Mr. Van Bastelaar saw that his co-pilot wasn’t flaring the jet—lifting the nose and cutting thrust—to touch down safely. “At the last moment, I took back control and managed to partly correct it, but we still had a very hard landing,” said Mr. Van Bastelaar, a 40-year-old pilot from South Africa who spent four years with a Chinese airline until he quit this year. Afterward, Mr. Van Bastelaar said his co-pilot immediately started checking the flight-data recorder to see whether he would face punishment for his mistake. Mr. Van Bastelaar and the other captains—who previously flew in Europe and North and South America—were lured to China by huge salaries. A captain at a U.S. or European airline would typically earn around $8,000 a month; Chinese airlines pay foreign pilots three times as much, tax-free. The foreign captains—which China recruits from countries it considers to have good aviation standards— described unsafe practices they had seen, including Chinese crew members plastering sheets of newspaper over the cockpit windows after takeoff. “Suddenly there was zero visibility. They said they didn’t want the sunlight on their skin,” one captain who recently left China said. Chinese pilots also live in fear of being grounded or having their pay docked for cockpit errors, foreign aviators say, leading to situations where pilots land too far down the runway to avoid hard landings. The foreign captains warned of institutional failings that can afflict an entire airline. Following a cold winter’s night three years ago, one captain realized that jetliners were being cleared for takeoff without deicing treatment. On paper, China and the U.S. have similar rules to guard against pilot fatigue. The big difference: In the U.S., there must be at least 10 hours between flights, including an opportunity for an eight-hour sleep, for that period to count as a rest. In China, however, airlines aren’t obliged to count the time between short flights where pilots aren’t in the cockpit. Pilots say this practice contributes significantly to fatigue. The problem is exacerbated by China’s chronic flight delays, which lead to restless hours stuck in airports. —Chunying Zhang contributed to this article. Since these newer planes are designed/built/routed/flown by computers, the airlines are hardly culpable for mishaps if those gizmos are operating during the accident sequence, no matter which nationality their flags denote. We're hearing the lauding of safety levels in aviation while planes are crashing, or landing at the wrong airports, being damaged by turbulence or disappearing into thin air. This dichotomy exists because everyone involved in the industry seeks to burnish the image of their chosen line of business, while ignoring the obvious: Pilots are too reliant upon automation and computer-flown aircraft. Even the FAA and NTSB have published their findings on this phenomenon. I do not bemoan automation, but for God's sake, FLY that machine once in awhile without all those circuits moving the controls and holding airspeed, altitudes, or headings, so you can maintain proficiency, and take over when those gadgets are disengaged, or they fail. Not only the horrendous facts in this article, products made in China are pretty much garbage. This infatuation with China is certainly misplaced. Their manufacturing costs may have been low, but the quality has been even lower, or non-existent. If the Chinese hadn’t been stealing commercial product secrets for many decades they wouldn’t be selling anything. People need to realize there is nothing to fear about any growth in GDP or their economy. Without the USA as a base from which to steal they would be in the toilet. Minimal creativity will always be there under any dictatorship.